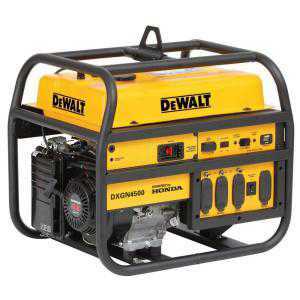 Click the button below to add the DEWALT 4,500-Watt Gasoline Powered Portable Generator with Honda Engine Manual Start to your wish list. The Dewalt DXGN4500 is designed with the professional contractor or rental operator in mind. This unit is powered by a 270cc Honda GX270 manual start OHV engine with auto shut off for low oil. The premium alternator provides low harmonic distortion. The large 7 gallon tank with fuel gauge runs up to 15 hours at 50% load. Features include a hydraulic/magnetic circuit breaker that provides overload protection, a digital hour meter for monitoring run time and tracking maintenance and an idle control to reduce noise and save fuel. The steel frame is job site tested and includes a lifting hook. An optional wheel kit in available.